Before we get into any FAQ's, I would like to address a situation that I see from time to time. Apparently, there are some individuals and/or roof cleaning companies that will offer to clean your pool cage, deck and/or driveway "while they are there" with their roof cleaning chemicals for an additional fee. Keep in mind that the chemical they wield is highly acidic and designed to be used on roofs only. I think most of them are doing this with good intentions, but actually they are prematurely aging your home's paint and the powder coating of your pool cage frame with these chemicals. This would be like saying that since muriatic acid cleans some surfaces, you could use it to clean your face or hands if you rinse it off fast enough. Unfortunately, it doesn't work that way. So be careful of who you hire to clean your home and know that roof cleaning chemicals have their place - on roofs. Is pressure washing safe for my home? Yes - if performed by an experienced professional. You may never see another company clean your home the way we do. We certainly haven't and we've been doing this for 16 years now. Our goal is to clean your home with the least amount of water and the lowest pressure possible. In fact, when cleaning the exterior walls of your home, we often use less than 500 psi, with even less pressure being used around windows, doors and soffits. You will find that 99% of our competitors only have one mindset - use high pressure on everything. I attribute our ability to clean with low pressure to our highly effective proprietary housewash blend. *Our cleaning agents will not affect your pool chemicals at all. Our cleaning agents do not contain any phosphates or chemicals to alter the chemical balance of your pool or affect your pool equipment, pumps, etc. in any way. I have tried just about every housewash on the market in the last 11 years and this is the most effective mixture I have ever used for releasing carbon pollution, grime, mold and mildew from your home's exterior. Our solution does contain about 4% bleach, but it is absolutely necessary if you want your home to be truly clean and mold free. Our housewash is formulated "specifically" to clean painted aluminum, concrete and wood as well as vinyl and aluminum siding without harming your paint the way that degreasers can. Never, never, never use a degreaser on your home's painted surfaces. (Unless you are going to paint-prep your home) Degreasers are designed to breakdown greases and oils and should only be used on driveways, patios, etc. I am always amazed to see other cleaning contractors using products like "Purple Power" and similar degreasers to clean homes. Why am I amazed? 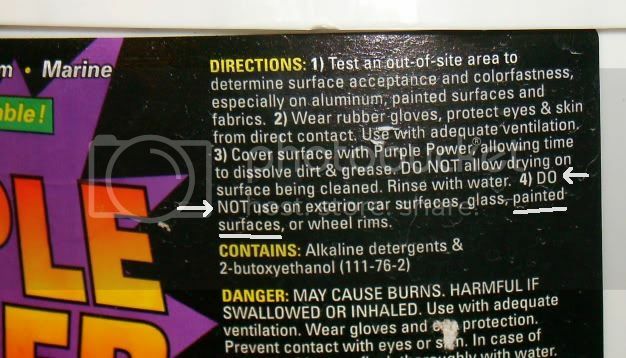 Because if you read the label, it clearly states "not for use on painted surfaces"! While it is entirely possible they may be completely illiterate, it is more likely that they just don't know or worse - they don't care. Degreasers are designed to remove and strip oils from the surface to which they are applied - which is NOT what you want on your $3,000 - $7,000 paint job! These are the little details that are important if you want your paint to last. On the other hand, you have many more cleaning contractors that don't use anything to help release dirt and grime and kill mold. Their only option is to use high pressure. THESE are the guys that I would not let work on my home. When you use high pressure, you are limited in the amount of time you can spend on a particular area. This means that even if the area isn't clean, you have to move on before damage occurs. The beauty of using low pressure cleaning is that it allows you to spend more time if needed to clean a spot or area without damage to the paint or surface. These are the secrets to superior results and happier, less-stressed customers. I am worried about you damaging the surface of my concrete and exposing the aggregate. Why does this happen? This is a very valid concern as I see this quite often. Damage like this most often occurs when a machine is used that has a low water output volume or low gpm (gallons per minute). Low volume machines are usually less costly to purchase, but can cause more damage. Because the water output is low, these machines must rely on high pressure to clean. Probably 99% of contract cleaners think that pressure is what it is all about. But nothing could be further from the truth. Even I had a hard time with this until I started using different machines and saw the truth. Higher water volume machines clean faster and more gently than smaller machines. It is in your best interest to avoid anyone using a machine with low water volume output and high pressure to clean your home or concrete. Machines with higher gpm's USUALLY cause less damage, but hiring someone with a machine that produces more than 3500 psi and little experience can also damage your concrete surfaces if they work too slowly or get too close to the surface. So, experience is important. This is why I can't stress enough the importance of "maintaining" your home. The fact is, everything has it's "clean / dirty" cycles, but by maintaining it at a cleaner level, you not only keep any mold or mildew from causing damage and staining, you also minimize the use of harsh chemicals and damage from pressure washing. "Maintaining order rather than correcting disorder is the ultimate principle of wisdom. To cure disease after it has appeared is like digging a well when one feels thirsty, or forging weapons after the war has already begun." "Ultimate principle of wisdom" - just as you value your health, you should value your home because they really do go hand-in-hand with retirement. Do I need to worry about my water bill? No. I am very aware of our water situation here in the Tampa Bay area. That is why I brush down every home before I even begin pressure cleaning. By removing webs, bees nests and debris before I clean, I don't have to rely on huge amounts of water or pressure to remove them later. Another way to conserve water is by "hand scrubbing" out stains, mud dauber nests and bird droppings during the pressure cleaning process. So, during the cleaning you will constantly hear me stopping, applying cleaning agents or stain removers and scrubbing them out before I proceed to rinsing. Most of my competitors don't consider this important, but you would be amazed at the difference it can make (See our Testimonials). Hand scrubbing eliminates the dangers of using a high pressure machine on your home. But more importantly, you get a superior cleaning because using the right cleaning agents and the right types of brushes are far more effective than just using plain old water. Do I need to move my plants or furniture from my patio? No. If we are cleaning your patio, all plants and furniture are watered before and rinsed down during and after the cleaning. We will clean around your furniture, then move and clean underneath them before putting them back. So, every area is spotless. Sometimes, we won't put your rugs back because those areas need to dry out before being covered by a rug again. Rugs can trap and hold moisture on the surface of your deck or patio causing discoloration and paint or surface deterioration. Your patio furniture will be treated with a mildewcide and rinsed clean as well. Please check your estimate. If there is no price on your estimate sheet to clean your deck and you are only cleaning your pool cage, then your furniture and plants will NOT be moved and your deck will only get a light rinse to remove any debris that may fall from the pool cage cleaning. *If we are painting or sealing your deck, then we will move everything out of your cage or patio area for you and then put it all back when we return to inspect the surface to make sure it is dry and ready for traffic and furniture. **TIP: Whenever I give an estimate for a job, price is delegated by time. Thus, if you have a lot of furniture or plants on your deck or around your home, they could add time to your job. Even though your estimated price will not change this time, if it takes me longer than I had anticipated to clean your home THIS time, then the NEXT time we clean your home, we will have to take that into consideration. So, removing or minimizing the amount of furniture or plants that I have to work around or clean under can keep your price down in the future. No, but vehicles should be removed from the driveway and parked away from the home, especially if you want us to clean your curbs at your street. Also, pool cage doors and gates should be unlocked for us to have access to the areas you want cleaned and all windows and doors should be shut and locked. If you have leaks around your doors or windows, then you should consider putting towels down along doorways (even though we use low pressure) and along any leaky windows you may be aware of. A little moisture or a light mist or spray won't hurt anything, but a heavy soaking may cause some damage to some flooring coverings such as wood or carpet. If you are a first time customer, then we prefer to get paid on the same day that services are rendered. This can be accomplished by either leaving a check under your door mat or on a back patio table, etc. Sorry, we do not take credit cards at this time. If you are a repeat customer, then we will be happy to leave you an invoice and you can mail us a check. The only other way we can take a credit card is if you want to pay us through PayPal by sending it to "jim@scrubbingbubbles.net". A dirty roof makes a home look older than it is. It also diminishes a home's curb appeal and can cut the lifespan of a 30-year warranted shingle roof in half. Those black streaks of mold on your shingle roof are actually digesting the organic tar base of your shingles. To mold, those tiny little granules are like giant boulders and as they eat away at the tar underbase, they begin to loosen the granules, which causes your roof to loose zinc and copper granules with each rain. (Ever look in your gutters or on the ground around the edge of your roof?) The loss of these granules accelerates mold and mildew growth, which then reduces your roof’s UV protection even more thereby prematurely aging your roof. Freeze/thaw cycles along with mold and mildew can be destructive to tile roofs too. Mold and mildew contain moisture and moisture expands and contracts at a different rate than the cement or terra cotta tile in which it is trapped, and this is how they form hairline cracks. Then mold begins to fill in these newer hairline cracks, which, when frozen, keeps expanding the crack until the tile finally breaks apart. So keeping them mold free is an important part of maintaining your tile roof. Our cleaning method for shingle roofs is performed as recommended by most all shingle manufacturers that are members of ARMA (Asphalt Roofing Manufacturing Association). In order to minimize granule loss, we clean shingle roofs with a chemical mildewcide that is applied as gentle as rain. And when it comes to the chemical application process, we try to use the least amount of chemical necessary to minimize any impact to your property or our environment. But remember, the longer you wait, the more chemical that will be necessary to clean your roof. Have more questions about roofs? See our Roof Cleaning page for more details. For roof cleaning, yes. If your roof is in good shape, we offer a no-cost, 2 Year, No-Streak Guarantee where if you see any streaks come back in a 2 year period, you just call us and we take care of it for free. For home exterior cleaning, no. We clean "mildew proof" painted homes all the time with some of them costing over $15,000 in "lifetime" mold-proof paint. The homeowner usually calls me after he gets tired of throwing chlorine on his walls every few months which is what the manufacturer often recommends. When it comes to home exteriors, the fact of the matter is that your home's location and surroundings as well as its inhabitants and usage will dictate mold and mildew growth as well as dirt, grime and pollution buildup. Some homes will naturally become dirty or moldy in less than 12 months, while others seem to last 2 to 3 years before a cleaning is needed. Your best bet is to clean as soon as you see streaks or mold to eliminate any chance of permanent staining or deterioration of the paint itself. Yes, we are licensed and fully insured as required by the state of Florida. That's right, REQUIRED by the state of Florida. We are insured up to 4 stories. I used to carry $100,000 of insurance, but in the past few years, I have noticed that my customer homes are much bigger than they were when I first started, so now I carry $1,000,000. Be cautious of those with little experience and no insurance as they can be a serious liability to you. Of course, if you're only having your driveway and sidewalks cleaned you may not feel that this is a big deal. But when it comes to caring for your home, a cheap price means nothing if they are hurt or cause damage to your property. You should also be cautious of hiring "part-timers" as they are often only doing this for "side money". With no reputation to worry about, the low price they often charge does not allow them the luxury of having insurance to protect you and your interests. One contractor I know, blew out a customer's kitchen window and caused $15,000 worth of damage. Think about this: If they are too irresponsible or lazy to even become insured or licensed, what kind of work ethic do you REALLY think they are bringing to your home? There are some good contractors out there and then there are some that are just "ok". Generally, these "ok" guys put little to no effort into improving their service or quality either because they really don't care, they don't plan on doing this for very long or they will only do the very minimum amount of work to get by. We are not a "splash-n-dash" outfit. I have watched other cleaning contractors clean the same size home as I am cleaning across the street in half the time and they're only using water and high pressure! Basically, just a high pressure rinse. There are several steps in achieving a superior cleaning job before housewash or water is even applied. Experience, patience and determination to do the job better than anyone else is what gives our customers a first class job. That's not just a saying, it's the truth. Values like experience, patience and determination are as rare as hen's teeth but to find someone that can actually "apply" these qualities to their work? Why, that's almost a miracle! Why aren't you listed in the phone book? I know some people think that a "real" business would be listed in the phone book, but at this point in time, I have more than enough work. I've been working 7 days a week just to keep up since 2007. This is why I don't have signs on my truck or trailer. If I were in the phone book, I would literally be overwhelmed to the point that I would probably just make even more people angry. So, until I find someone like myself, there is no point in advertising to the masses.